Reading the reviews on Mushroom Point had me and my travel buddy a little bit worried but I had no doubt it was going to be a cute little mushroom shack across the road from the beach and that it was. I think mushroom point is awesome!!! It's got its own quirkiness to it which I loved. The staff were lovely, theres a nice little chill out zone that's close to the bar 😜. All in all I thoroughly enjoy my stay. If your after something comfortable and relaxed i recommend booking at mushy point. We loved our stay here. The location was great (hard not to be in a small place like Otres), and yet far enough away from the noisy spots at night so we could get some rest when desired :) We had a giant double bed in our own little mushroom pod, with a private bathroom, and it was perfect!! Didn’t stay long enough to really appreciate it. The rooms are really nice to sleep. I could have slept in for days. It’s very Sandy... cause it’s on a beach. Amazing location for the sunset. What a cute place to stay!! Turns out we had booked two 'mushrooms' in two separate areas of the resort (one on the beach and one on the other side of the road)... and didn't realise until we arrived! 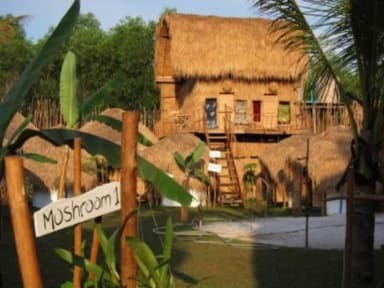 The owner was very chill and accommodating and switched our booking so that we were in two mushroom huts on the beach. She even upgraded one mushroom so that we got huts of the same value as we had booked for. Lovely service, massages on the beach and one of the very best meals I had in Cambodia! Very cool idea, but it is exactly what you would expect. A humid/buggy hut on the beach. 2 nights here was plenty. For novelty’s sake one night stay is fun, beds are comfy. Apart from that, the lack of walls aka hear everything your neighbours say and do... mozzies attack (their nets are filled with holes) and lack of privacy in the shower/toilet makes for an uneasy longer stays. Pizza was amazing, location was good but the overall vibe wasn’t very friendly. If I could rate this property lower I would. We booked a hut on the beach and when we got there were told that the beach was closed in the low season. The member of staff found it funny that when I asked to speak to his boss about the problem that she was away in Italy. 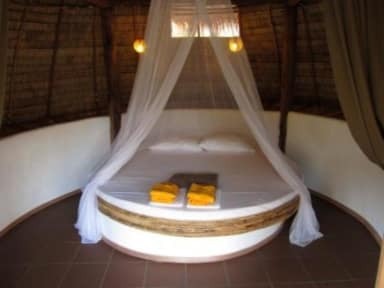 When we did get to the room, the door would not shut, the mosquito net had holes in it. The room had obviously not been cleaned, and parts of the roof were disintegrating on the bed.